This is not a review post, but more like a lookback for me. We used to stay in Bhowanipore, and most of my adolescence was spent here. In those days, an youngster didn’t get that much pocket money and being a lazy-bum or due to whatever reason, I always used to have a shortage of pocket money. 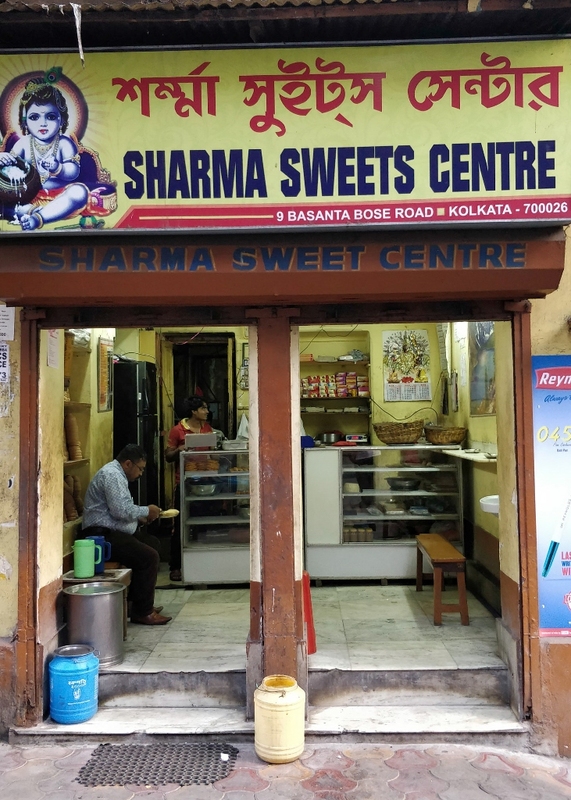 So, while studying my +2 standard in Ashutosh College, a humble shop named Sharma Sweets, tucked inside the adjacent Basanta Bose Road, used to come to my rescue, every single time. So, this will be the story of that place. We had shifted from Bhowanipore to the eastern part of the city some two decades back, leaving behind one heart-broken fat, adolescent kid. And, I don’t know why, still, after so many years and not being a nostalgic human being, I still keep going back to that area. And, when the Cafe is just across the road, how can I not ? 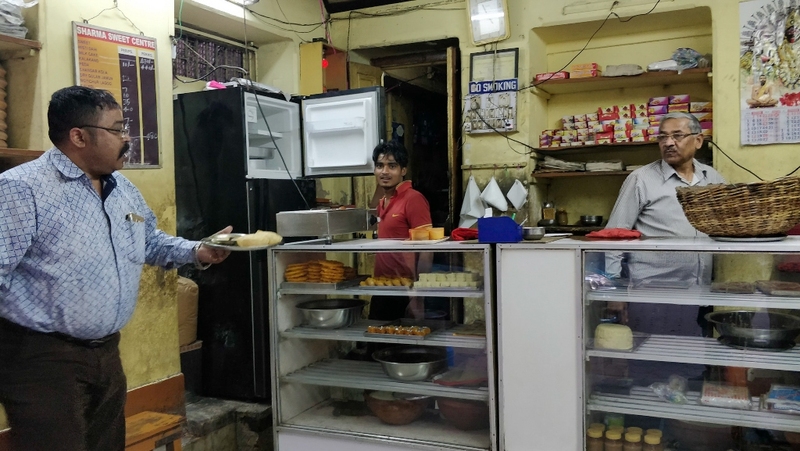 So, this is a typical sweet-shop, nothing special, your typical friendly neighborhood shop, with that mandatory typical smiling uncle, the shop-owner and some careless staff running around like headless chickens. The item list is also pretty simple. Much emphasis had been given on savory items like Kachori and Samosa and less on sweets. But, what I distinctly remember is about few of their items (carelessly written on a old, old menu-board and hung) and those two rickety wooden benches. And, when after so many years, I went back there for a quick lunch, for just 10 minutes maybe, I was witnessing myself ……. They were 2 kids, college kids in all probabilities, in early twenties. It’s that age, when happiness doesn’t mean getting that super expensive car model or booking another flat. Just one smiling glance from your that-special friend makes your day. And, let the world go to hell, you used to think, you could tear the world apart for your friendship. That age, when a gala treat means a plate of roadside biryani paired with some jhari, few winks, unnecessary loud cursing (to show smartness) and loads of laughter…..
Coming back to now, they were sitting together, closely … very very closely, whispering something into each other’s earlobes, those sweet nothings. And, watching me and sensing that I will take a long time, gave me a dirty glance. Who the hell was I to invade into their private place ? But the point was, I was looking at their plates. They were sharing one plate of Samosa chat…… And, suddenly another fat young boy with his special friend appeared in my memory. They used to have this same thing. While, his choice used to be those hot Samosas (with bhaja masala crushed), her choice was slightly tangy and sweet one- the samosa chat. Sharma sweets, used to make a nice samosa chat then. 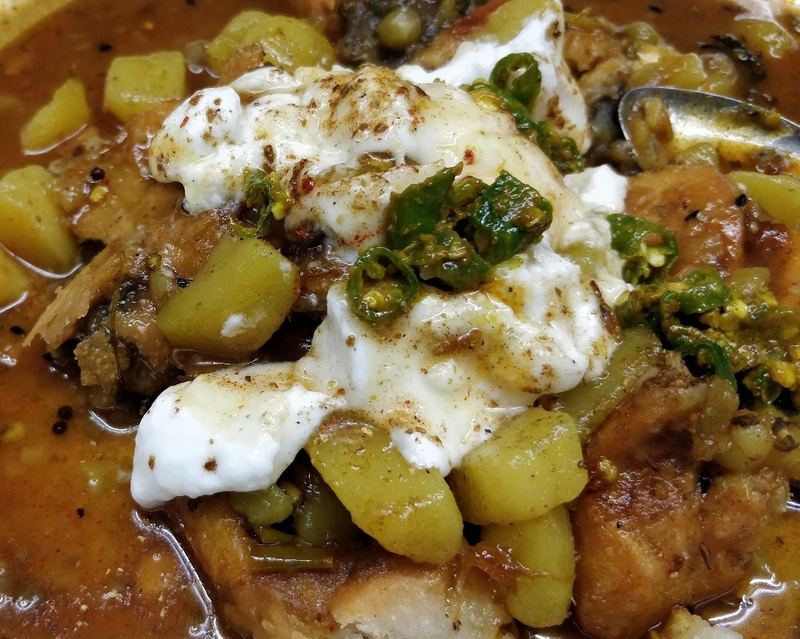 Hot sabzi for kachori was poured generously over hand-crushed Samosa and the chilled curd (almost at a hung curd consistency) was used as a topping. Then suddenly, out of nowhere, the sweet jaggery-tamarind chutney was poured along with a sprinkle of some secret masala. And being the typical bong boy, he used to say “dada, mitha chutney thora zaada dalna” – I heard myself utter those very same words this time also. Only this time, as with age some external spice was needed in life, my mouth asked for some pickled chilly to be put on top. 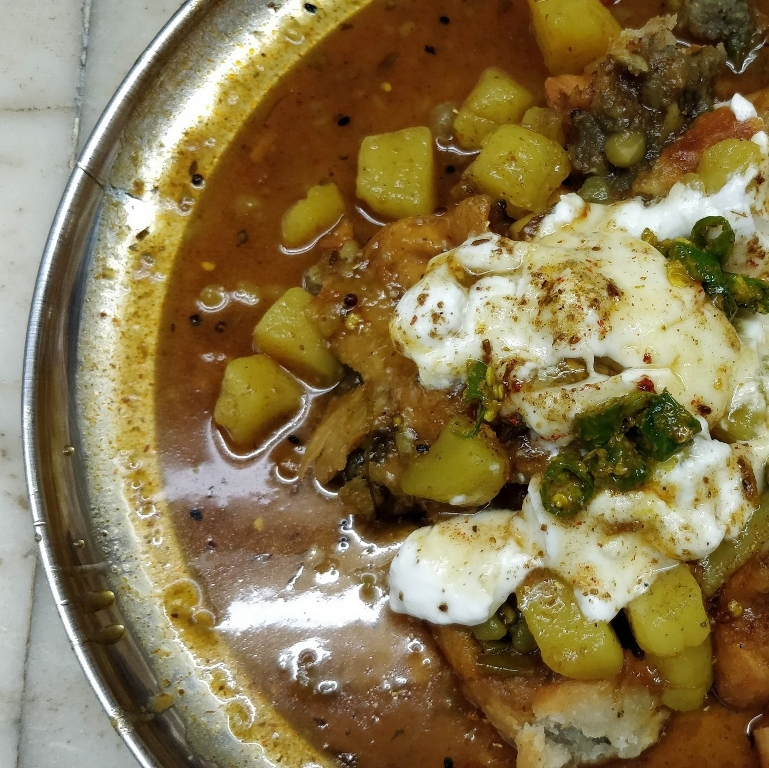 Now, that boy used to put his spoon vertically on the plate, so that the hot samosa and sabzi was blended perfectly with chilled topping and put the spoon into her woman’s mouth- while she used to make love with him with her eyes. It used to be a spoonful of heaven then and I felt the situation has not changed since. These kids were doing just the same. Characters have changed only, story-line remained still the same. That fat kid used to secretly check his purse after this then, because chivalry still ruled and he had to order a glass of lassi. 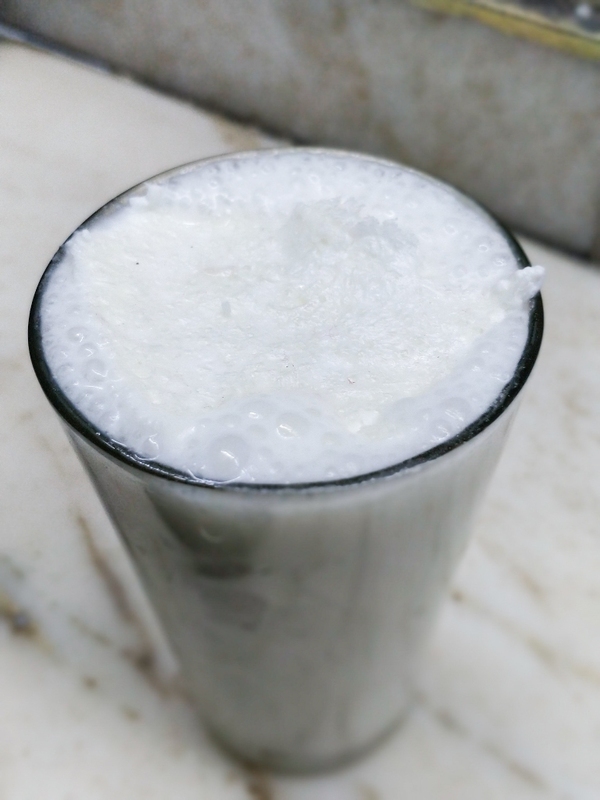 But, now, I ordered the glass … and somehow my mouth again disobeyed my instruction and ordered “Baraf kam dalna bhai …”The lassi is still thick, pretty thick and a slice (again hand-picked, literally) was put floated on top of the glass. That boy used to ask shamelessly for some more, but age didn’t allow me to go for it. Still, even in 2018, it’s heaven. The lady, in front of me, shyly wiped the reminiscent of curd from his man’s lips – with handkerchief. After all, he’s hers and can’t be looked untidy in front of the outside world. Their eyes kissed. These kids now have already ordered for something, which was unavailable then- or didn’t the fatso know of its existence ? 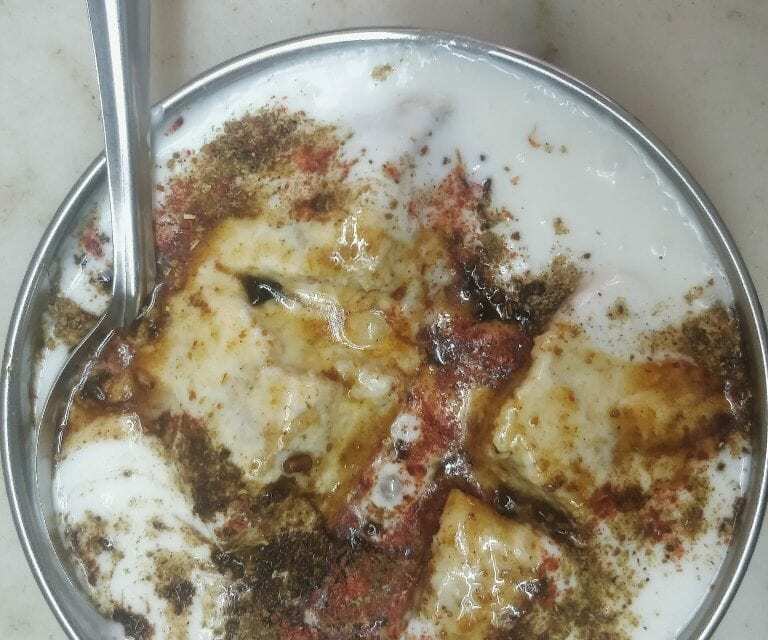 Á plate of Dahi Jilebi. 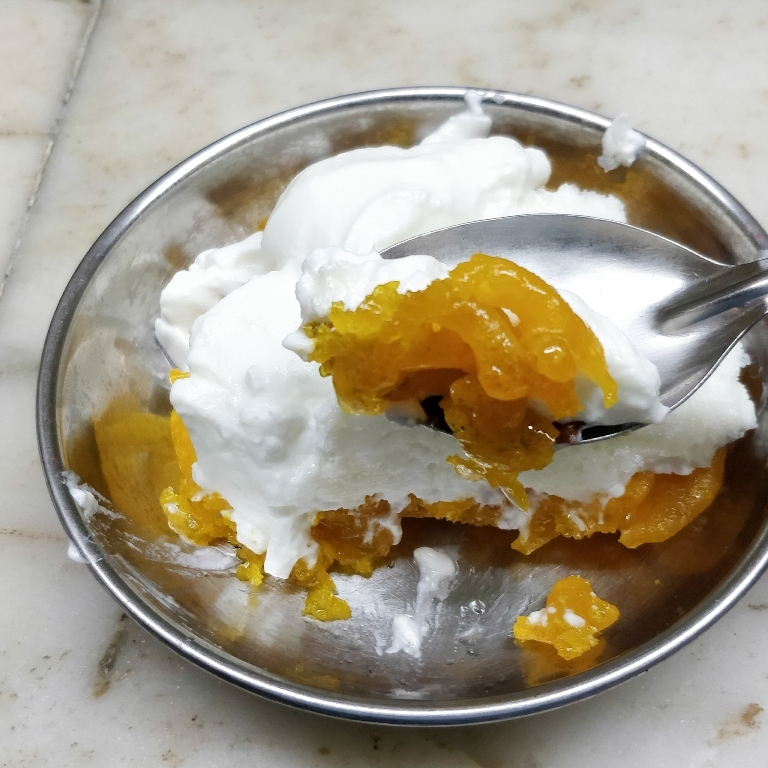 So, it’s one (or two) jalebi one a plate, topped with a chunk of curd and bingo, again topped with a slice of matha ….. They charged probably 30/- for this, but it’s a slice of heaven. 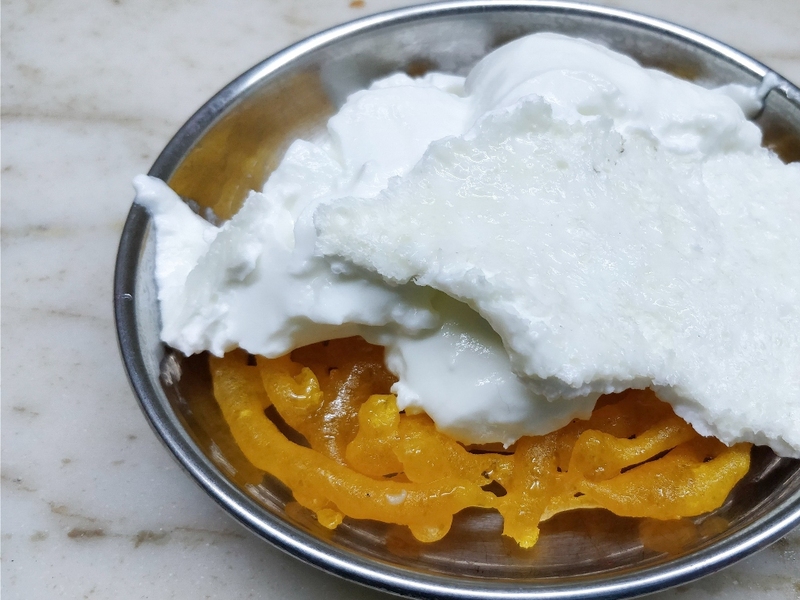 The sweetness of jalebi, topped with the sour curd and finished with the matha- unimaginable ….. We do have to learn a thing or two from this generation, it seemed to me. The lady, was asking the boy “Doi vada khaoabi ?” The boy just smiled, today he brought his queen and what was this ? 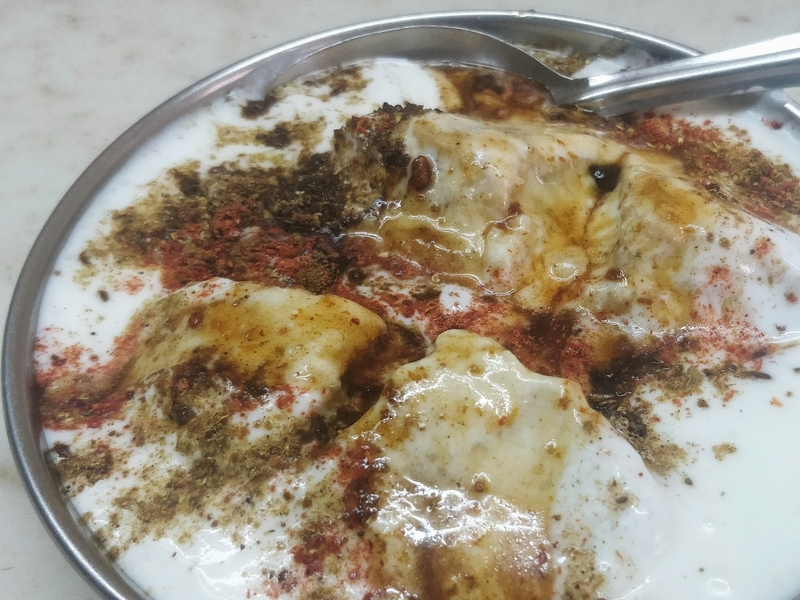 Request for a Dahi Vada ? 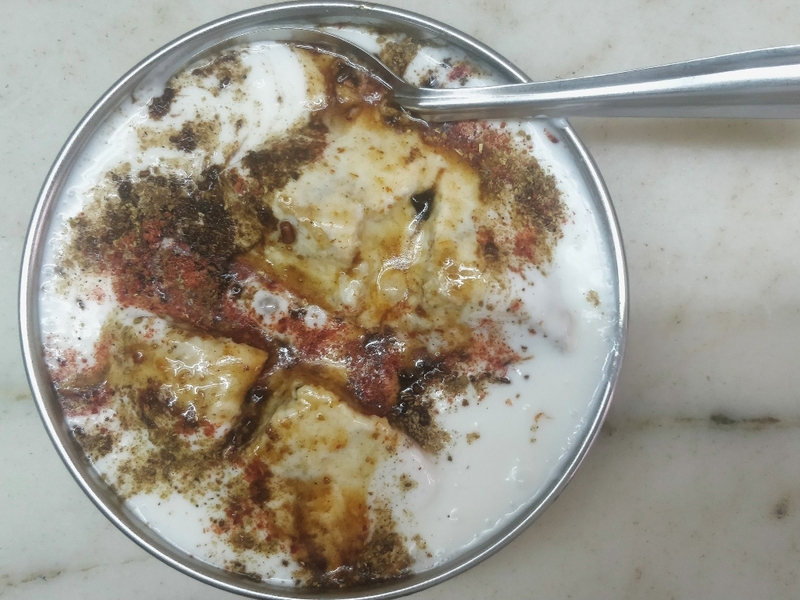 “Dahi Vada Dijiye bhaiya, extra sweet chutney daliega” was the instruction, he knew her taste buds ….. The dish is still simply value for money, solid dal vada, topped with cord and sprinkled with crushed cumin, Coriander, Rock Salt and some red chilly. the result was magical. It was a blend of saltiness and sourness, balanced by a tinge of sweetness. 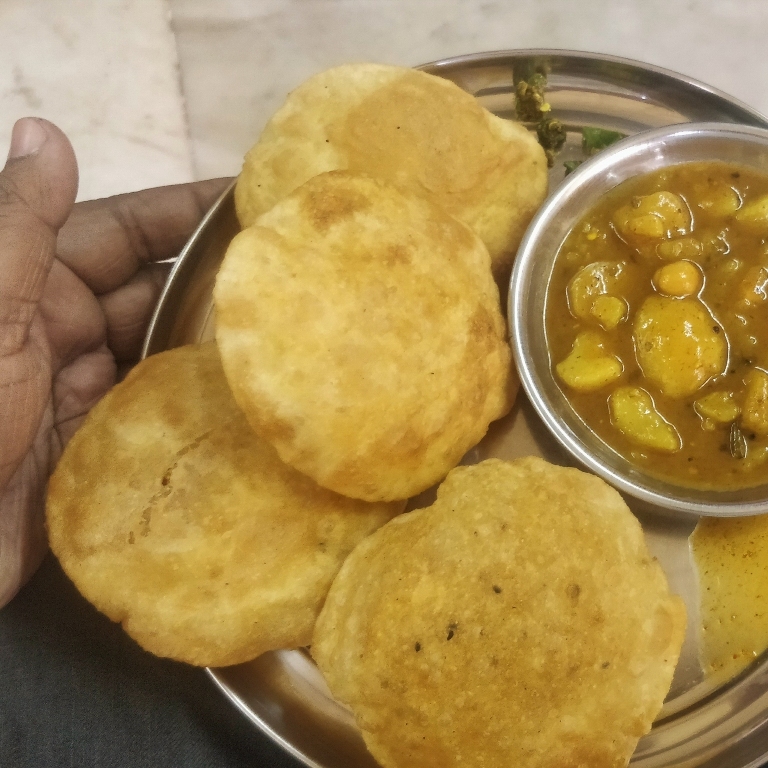 In memory of that fatso and on a second day, I ordered for a plate of Kachori there. Maybe due to the absence of the student couple or because I’ve tasted better staff at shops nearby, it seemed pretty okay-ish to me and nothing special ….. I know, this post is a bit cluttered, something is missing and definitely not like my usual blog-posts. But, this shop kinda baffled me and those kids worked like a time machine for me. My sincere apologies. 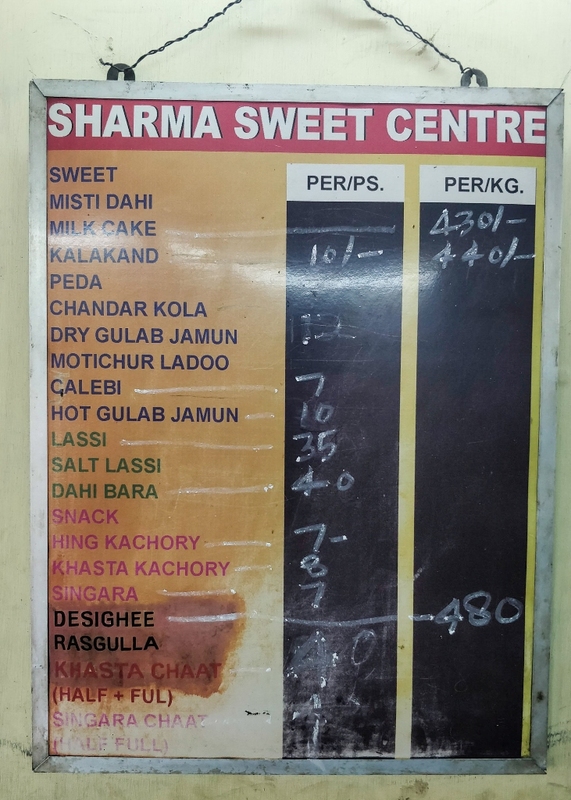 But all said and done, this shop definitely deserves one visit at least- al least for the Lassi, samosa chat and Dahi-Jalebi. Samosa chat ❤️ Dahi jalebi ❤️. You are almost forgiven for not giving enough importance to Maharani. Almost. Jokes apart, written from the heart. It shows. Food and emotions are a deadly combo and always bring out the best in us.